And open your heart to a child today! When you sponsor a child, you’re not just supporting a child, you’re supporting an entire community. Parents are taught how to grow more food, upgrade their skills and boost their incomes. Schools are provided with nutritious meals, upgrades to their facilities and training for their teachers. You’ll receive a pamphlet with a photo and information on your sponsored child, their family circumstances, and the community and country in which they reside. You’ll also receive a Frequently Asked Questions guide about child sponsorship. Each October, you’ll receive photos of your sponsored child, their community and school plus health and family status updates. You’ll also receive the thrive! newsletter with stories about how your support is making a difference for children and families around the world! For only $29 a month, you can make a world of difference for a child. You’ll provide good nutrition, educational materials, family support, community development and so much more. We’ll keep you in touch with your sponsored child with regular updates so you can watch them grow and thrive. Your monthly donation is pooled with those of other Canadians to create a network of support for your sponsored child, and keep administration costs low. That way, we’re able to ensure your sponsorship goes a lot further. Like you, we value making a difference in the world. When you sponsor a child through Canadian Feed The Children, you’re carrying on a proud Canadian tradition of generosity that makes this world a better place for everyone. We’re standing by in our Canada-based office to support you and your sponsored child throughout your journey together – just give us a call. We believe that every child, everywhere, deserves the chance to have a bright future. As a non-faith-based organization we welcome everyone into our family regardless of religion, race or cultural background. Your sponsored child is supported by an inclusive and holistic program that values, respects and celebrates their local community’s traditions. We’ve been working with local partners since 1991 to deliver our Sponsor a Child program in the following countries. In Bolivia we support children with early childhood care and development, good nutrition, and safe spaces to learn and grow – giving parents who work away from home peace of mind. In Ethiopia we give children access to quality education, support parents to learn new skills to earn a sustainable income, and help communities to grow more food during times of drought. Our newest Sponsor a Child program in Ghana gives children access to quality education, supports parents to learn new skills to earn a sustainable income and grow more food, and helps communities become more resilient against climate change. In Uganda we give children access to quality education, provide healthy meals at school, support parents to learn new skills to earn a sustainable income, and advocate in communities for children’s rights. We are an award-winning organization. We were named as a Financial Post Charity of the Year in 2016 and 2017, a Charity Intelligence Top 100 Rated Charity in 2018 and a MoneySense Top 100 Charity 2019. When you sponsor a child you are placing your trust in an organization that is an accredited member of Imagine Canada as well as a Better Business Bureau’s Wise Giving Alliance Member. How is my child sponsorship donation used? When you sponsor a child your monthly donation is combined with those of other sponsors and sent to the project in which your sponsored child is enrolled. Your sponsorship provides many benefits, including education, healthy food and access to clean water for your sponsored child and their school mates. You also support community development activities that benefit your sponsored child’s family and community. Why does child sponsorship through CFTC cost less than other programs? Your sponsorship is combined with that of others to create a family of supporters to care for one child, family and the community they live in. We keep administrative costs low related to direct communication with your sponsored child. This approach creates an affordable option for Canadians to experience the joy of sponsoring a child while providing lasting benefits to thousands of children. Can I communicate directly with my sponsored child? We do not offer letter writing or direct gift giving between sponsors and their sponsored children to keep administrative costs low and to ensure the program is perceived as equitable and fair among children and in the community. Each year you will receive an update letter with a 5×7 photograph of your sponsored child, details about the child’s past year, and information and photos from their community. Plus, you’ll receive a semi-annual newsletter, thrive!, which provides stories and photos about the work donors like you are supporting in each of our sponsorship countries. If you have additional questions about your sponsored child, please contact us at 1-800-387-1221 or 416-757-1220 or via email at [email protected]. What happens if my sponsor child leaves the program? Sponsor children leave the program for a variety of reasons, most commonly because they graduate from school. Our goal is to create the conditions where every sponsored child completes their education and goes on to a happy, productive life! Most of our sponsors are happy to transfer their support to a new child who is waiting for sponsorship. To save time and administration costs, we will make the change automatically and send you information on your new sponsored child, enabling your sponsorship support to continue without interruption. What is my sponsored child’s religion? Canadian Feed The Children is an inclusive, non-faith based charity that serves all children, regardless of race, gender, culture or religion. We do not inquire about a child’s religion, nor is religious education a component of our work. Are my sponsorship payments eligible for a tax receipt? Yes. Canadian Feed The Children is a registered charity and all donations are eligible for a tax receipt. You will receive one official charitable tax receipt in February (in time to prepare your taxes) for the total amount of your donations for the previous year. If you have misplaced your tax receipt or have any inquiries about receipting, please contact our Supporter Services team on 1-800-387-1221 or 416-757-1220 or via email at [email protected]. How much of my monthly donation goes to the Sponsor a Child program? CFTC is committed to ensuring healthy program ratios. 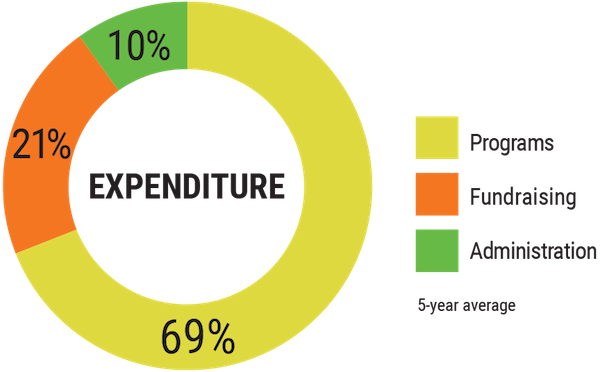 In 2017, we spent 80% of funds raised on programming, 15% on fundraising and 5% on administrative costs. So on average, $21.75 of your $29 monthly donation will go to your sponsor child’s family and community, while the remaining $7.25 will go towards operating costs. For more information please download our latest Annual Report. You can pay for your monthly sponsor a child contributions via Credit Card or Direct Debit. For credit card payments we accept Visa, MasterCard, Amex, Maestro, Discovery or JCB. Direct Debit payments are available for all Canadian banks. What happens to my sponsor child if I cancel? Our sponsorship program allows each child to have up to three sponsors, which means that if one child sponsor cancels there’s generally at least one other donor supporting the child. You can rest assured that the child will remain in the sponsorship program and that they will continue to receive ongoing support. If you’re still unsure about sponsoring a child you may want to read our post Best Child Sponsorship Programs in Canada to learn how to find the best sponsor a child organization for you. Alternatively, you can browse the other ways to support Canadian Feed The Children. What is the process for cancelling my child sponsorship? You can cancel your monthly child sponsorship payments at anytime by simply contacting us at our Toronto Head Office on 1-800-387-1221 or 416-757-1220. Our business hours are Monday – Friday, 9am – 5pm Eastern. You can also email us – [email protected] – with your cancellation request. Please include the full name and email address you used to sign up to become a child sponsor. Please do not include any financial information. No children have been selected for sponsorship.